This is the entrance to the Halloween Store, go down the stairs and you're there. 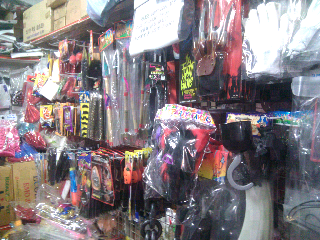 What's Offered: Huge quantity of adult Halloween costumes, Halloween decorations + accessories such as wigs, masks, chains, ect., some Christmas decorations, and some birthday stuff, a small selection of children's costumes - mostly for 7 years and up. What's Not Offered: Halloween candy, baby costumes, toddler costumes. 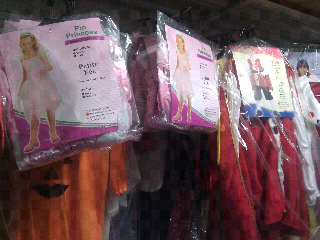 mom's looking for baby/kids costumes though there are a few princess, spiderman ones. It's also a good place for teachers who want to decorate their classrooms for Halloween. exit 14, walk straight out quite a bit more than 50 meters till you get to the part of the sidewalk with the wall along your left side. 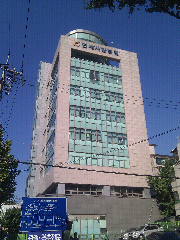 Continue to the three-way intersection. Turn left and immediately cross over the crosswalk to the other side, turn left, and immediately turn right down the first alley/sidestreet. 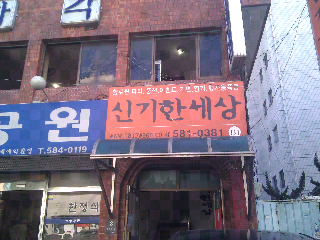 Halloween (with an orange sign in Korean) is about 20m down the sidestreet on your right, in the basement.